Brainy Family Vacation Essentials Offer Extra Distractions When You Need It. Filling the lag time during your family vacation is easy when you have a brainy bit of fun in your backpack or carry on. Recently we kid-tested several portable games and five received high marks for delivering brainy fun along with skills development value. Yes, I believe learning and fun go hand-in-hand and family vacations should be all about fun. 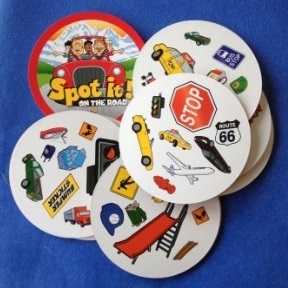 Blue Orange Games always delivers brainy fun and Spot It on the Road is a perfect example. These vacation essentials are so cool that I am not just writing about them. Every month for the next five months Family Travel Files will be providing a chance to win one of the top brainy picks from our list. All you need to do is sign up and like us on Facebook. Travel Qwirkle. Mindware now has is a handy travel-size portable version of the popular mind game. Everything that makes the original game awesome is part of the travel version. Spot It on the Road. Blue Orange Games always delivers brainy fun and produces timeless yet portable games to energize young minds and old minds as well. Music for Little People. Sometimes the only way to relieve stress and change the mood of the day is with the distraction of music. We all have our favorite selections and certainly music choices depend on the age of your children and your desire to listen to the music time after time, after time. Audio Trip Distractions for Trips. Boomerang, the audio magazine, is an essential component of any family roadtrip, plane trip, or a rail journey. Tune in to great dialog about relevant topics presented in a pure kid style with quirky anecdotes, humor, plain facts that matter. Nature Kaleidoscope. With this fun and educational kit made in the USA by Toysmith youngsters are able to make a kaleidoscope over and over again using elements from nature. What’s in your backpack? Sign up and like us on Facebook and you may be one of the lucky winners.